ART- SUPER NATURAL FAIRY TALES- ORIG UK LP 1967 PINK ISLAND PSYCH NO RESERVE !!! Original 1967 UK FIRST MONO PRESSING. What an all time classic LP this is. 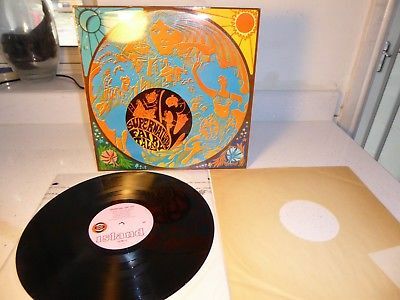 A beautiful psychedelic (front laminated only) none gate fold sleeve in EXCELLENT condition. SUPER and NATURAL are slightly damaged. Other than that it is hard to knock this sleeve. The original inner is present and has disscolouration from the light. with the smooth rim.Both labels are faultless so in EXCELLENT condition. Pressed on real heavy duty ENGLISH 1960`s vinyl. Side two also has a bright luster sheen to it but more hairlines than side one. too makes no difference to the playing ofthis great LP. ++ but it plays better . A PENNY START AND NO RESERVE !!!!!! Please click see sellers other items. recordsover the next few weeks. Postage and packing is as follows. I DO NOT POST TO THE RUSSIAN FEDERATION, THE UKRAINE OR ITALY. WITH THE EXCEPTION OF THE COUNTRIES LISTED BELOW. I DO NOT SHIP TO THE RUSSIAN FEDERATION . ITALY or THE UKRAINE. All my records are housed in Mobile Fidelity Mastering Sleeves. of the original inner sleeve .